…but not for Sheriff Piper Blackwell. Fifty-eight minutes into her first day on the job she’s faced with a murder—the victim artfully posed amid the decorations on his lawn. Fresh out of the military, twenty-three-year-old Piper is in charge of a manhunt during the most brutal winter sleepy Spencer County Indiana has experienced. Her opponent in the recent election…Chief Deputy Oren Rosenberg…doesn’t like her; she has no experience working in a sheriff’s department, and he wants her to fail. Piper doesn’t like him either, but she needs him to help catch the killer. In a deceptively peaceful county where everyone seems to know everyone else, a murderer hides in plain sight, and Piper and Oren are thrown together in the hunt. That’s not the only crisis Piper faces. Her father, the previous sheriff, fights for his life. 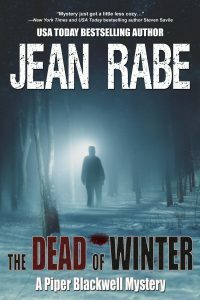 Facing personal and professional threats, Piper has to weather the winter storm, keep the sheriff’s department from crumbling around her, and reel in a killer before he claims another victim.